The puppies had a very busy day. They spent the morning out on the deck and when Mark came home after work, they got loaded up in the truck with the big dogs and driven down to Paris. They had a big walk in the field and then they went swimming in the pond. They swam one at a time and everyone seemed to really like the water. After their swim, they had a second walk. 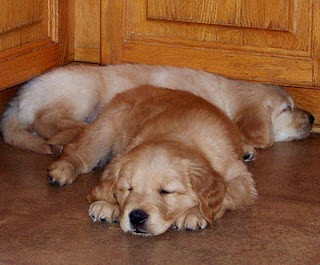 When they got home, they were VERY tired.